The San Francisco, CA workshop takes place at Mamen Saura's home in Palo Alto, CA. If anybody needs a hotel, we will let you know convenient options. This isn’t a classroom-type workshop. It takes place at Jeffrey and Winslow’s home and is limited to just four participants. * It begins the first evening with a home-cooked dinner and discussion on choosing the right raw files for post-processing and continues through large-format printing the final afternoon. *A special After The Adventure will be hosted by Within The Frame alumna-extraordinaire Mamen Saura in San Francisco, CA (actually Palo Alto, CA) from May 17–19, 2019. Participants must bring a laptop with Lightroom (a 30-day free trial is available if one doesn’t already have Lightroom; click here for a link to that “Free Trial”) and the raw files they wish to process. Bring 50 raw files. From those, we will select which to post-process. We will supply Epson Ultra Premium Presentation Paper Matte for your prints. This is a beautiful archival paper that is great for learning to see your prints. You do NOT need to be an expert in post-processing to participate in this workshop. Jeffrey and Winslow will work with you on every step of the process. We will begin with a slideshow of Jeffrey’s and Winslow’s photographs (with before and after examples) followed by a home-cooked dinner and a discussion on What Makes a Great Raw File for Post-processing. The morning session will begin with Editing 101: Selecting Which Photographs to Post-process, after which Jeffrey and Winslow will help each participant select an initial 5–10 photographs for post-processing. The second morning session is an Overview of Lightroom’s Library, Develop, and Print Modules. Any participants already familiar with Lightroom can skip this session and begin working on Post-processing. We will break for a home-cooked lunch (outside under the Tulip trees for the Maryland editions, if the weather cooperates). The afternoon session will concentrate on Post-processing, Preparing Files for Printing, and Printing some of your beautiful creations. We will finish the day with a home-cooked dinner, complete with wine and laughter as we admire the day’s prints before heading outside to sit around the campfire (for Marlyand editions, weather permitting) and philosophize over the joys and hurdles of photography. This morning we will continue with Post-processing Tweaks and Printing. It’s not uncommon to need to print and reprint a photograph three to five times while working to get it right. We will break for a home-cooked lunch and spend the early afternoon finishing any last prints, including Large Format Prints. A $250 deposit is required to confirm your participation. Click on the Pay Deposit button to reserve your spot. You will be able to pay the deposit via PayPal or credit card. To pay by check or other methods (or if you encounter difficulties), please fill out the Registration Form and request an invoice in the comments. Please read the Cancellation Policy and the Release of Liability. 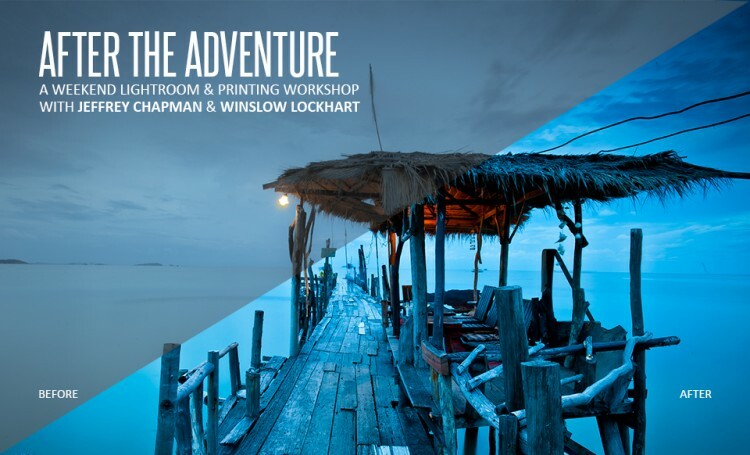 After The Adventure is also available as a semi-private (2 participants) or private workshop by request. Please use the form below to request this option or to ask any questions. As these workshops are by invitation only, this page does not appear on the homepage, workshop page, or in any menu item. Bookmark this page if you’d like to refer back to it.